At the African Union’s (AU) 21st Ordinary Session of the Assembly of Heads of State and Government in Addis Ababa from 26-27 May, the African Capacity for Immediate Response to Crises (ACIRC) was tabled – by South Africa. 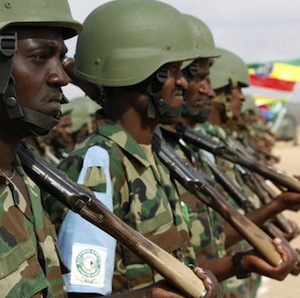 The African heads of state present may have been somewhat surprised because this has been an initiative of the AU Peace and Security Operations Division. Essentially, the ACIRC is a new military-intervention tool aimed at implementing operations under ‘scenario six’ of the AU’s African Standby Force (ASF): immediate combat intervention based on a humanitarian imperative to save lives, typically involving stopping or preventing emerging genocide, crimes against humanity, atrocities or war crimes by armed rebel forces. The ACIRC has been proposed as a temporary transitional measure because of the failure to fully operationalise the Rapid Deployment Capacity (RDC) of the ASF. To implement the foreseen operations, the ACIRC will have integrated combat units of 1 500 troops with many specialist capabilities. Drawn from a pool of about 5 000, they will have to be highly trained, specially equipped and war-fighting capable, with the ability to be rapidly mobilised to gain early entry to the mission location (i.e. within 14 days of mandate authorisation). This robust military force would of necessity include a large airborne force capable of interventions necessitating air-dropped (by parachute) or air-landed (roll off the aircraft and start fighting) operations. One glaring omission in the force design appears to be the absence of any police, civilian or other specialised non-military components, which the United Nations considers critical in complex mission environments with mandates that include establishing the rule of law and protecting civilians facing imminent threat. Although Africa and the AU have long needed such a capability, it is essentially a duplication of the RDC, which is currently structured within the ASF in the form of specialised and high readiness battalion (plus) sized capabilities in the standby brigades of the five Regional Economic Communities (RECs). However, critically, there are only three REC brigades that can be considered fully operational: those of the Southern African Development Community (SADC), the Economic Community of West African States (ECOWAS) and the East African Community (EAC). The glaring question is why a duplicate structure is considered necessary when the existing ASF is able to provide robust airborne and combat-capable forces at short notice for deployment to any location in Africa? The critical enablers that they lack – such as medium and heavy airlift capacity to rapidly deploy – would also be faced by the ACIRC. A focus on enhancing the RDC capability within the ASF to full operational levels would surely make more sense than an independent new structure, albeit a temporary one. The willingness of the AU to embrace the notion of the ACIRC may be largely attributable to the situation in Mali, where the AU and, specifically, ECOWAS (which includes Nigeria, one of Africa’s ‘superpowers’) were unable to rapidly field an effectual intervention to restore the rule of law. The eventual deployment of the African-led International Support Mission to Mali, authorised by the UN Security Council, came 10 months after the rebels had seized northern Mali. Deployment time scales of the initially proposed force ran into months instead of days and there were severe shortages of critical force capabilities. After 10 years in the making, the ASF could not deliver the necessary action when it was most needed. However, it should be noted that there were many compounding dynamics at play in the Mali situation, not least of which was the intransigence of the military dictatorship ruling Mali. The coup d’état had left the state in disarray, enabling rebel groups in the north to launch their fast, effective military campaign, which routed the demoralised Mali Armed Forces. Nevertheless, the end result was that, once again, Africa proved incapable of providing a rapid African solution to an African problem, leaving it to the French, who were able to deploy an intervention capability within days of the rebel forces in Mali initiating a new campaign to take the capital, Bamako. Consequently, the ASF – and specifically the concept of the RDC component – lost credibility. In moving away from the REC-controlled standby brigades and their rapid deployment component to an AU, centrally controlled combat force (the ACIRC), which would be dependent on force-structure contributions from African military powerhouses, the AU runs the risk of creating a duplicate capability at great cost to the contributing states. This would also undermine the ASF brigades’ capabilities, which are constituted, provided, financed and controlled by the regions. Furthermore, having regional forces with regional authorisation processes allows for consensus, political authorisation, and checks and balances. Removing these would leave a great deal of power in the hands of the AU secretariat, the AU Peace and Security Council and the small ‘club’ of willing-and-able ACIRC countries, like South Africa – which could then be described as the new ‘policemen’ of Africa. But will these states be able to afford the heavy price tag of deploying – which could easily exceed $100 million for an intervention of even limited duration? In addition to creating a new focus that may undermine the imperative for the RECs to fully operationalise their regional brigades by 2015, the AU also runs the risk of allowing undue influence by the small, but influential, new ACIRC club over Africa’s security issues. Proponents of this process argue that it has been 18 years since the Rwandan genocide: a defining period and a primary motivation for Africa, through the AU and its RECs, to develop its own military peacekeeping and peace enforcement capability. This would bring credence to the AU’s position of never again allowing incidents like the Rwandan genocide to occur – where over 800 000 people died in 100 days of savagery, while the world stood by and watched. One of the tragedies of the situation was that there was a UN peacekeeping mission in Rwanda, consisting of 2 548 military personnel, hamstrung by a UN Security Council mandate described as ‘observe and report’. In hindsight, African leaders decried the continent’s inability to rapidly deploy an intervention force to stop the genocide – one of the reasons for creating the ASF. It has been argued that the situation in Mali was developing all the hallmarks of ethnic and religious conflict, and the country was teetering on the edge of being a ‘failed state’. Atrocities, human rights abuses and possible mass civilian casualties may have ensued had the rebel forces captured the capital city. The ASF’s rapid intervention was clearly called for. But after years of development, it appears the ASF is a force still incapable of doing the job it was designed to do. The solution? Enter the new ACIRC. But is this truly a realistic capability that will save Africa from the risk and embarrassment of dependence on former colonial masters like the French for military intervention? Is it the new politics and language of deterrence with real capabilities? The bottom line is that Africa will have a new elite – a club of those states that can ‘walk the talk’. For humanitarian reasons, this can only be a good thing. However, given the complexities of African politics – generally characterised by extensive consensus building before decisive action – it is perhaps a tool smacking of imperialist origins and may be prohibitively expensive for contributing states to establish, maintain and deploy. Similar to the proposed SADC deployment of a Neutral Intervention Force to the eastern Democratic Republic of Congo, the ACIRC may be another knee-jerk reaction, with serious flaws – a factor that may have been overlooked in the rush to put an ‘African solution’ on the table.